As we’ve outlined before, there are a number of different ways to follow Pro Football Rumors via Facebook, Twitter, and RSS. If you don’t want to follow all the site’s updates, you can subscribe to team-specific or transaction-only Facebook, Twitter, and RSS feeds. Although we don’t have Facebook pages or Twitter feeds for specific players, it’s easy to follow all our updates on your favorite player as well. If, for instance, you want to keep track of all the latest news and rumors on Oklahoma quarterback Kyler Murray in advance of the draft, you can visit this page. If you’re interested in keeping tabs on the latest news involving Joe Staley‘s plans for the future, you can find his page right here. In addition to dedicating pages to players, we also maintain archives for certain specific non-NFL topics. For example, all our posts relating to the XFL can be found here. Every player we’ve written about has his own rumors page, and each of those players also has his own RSS feed, making it even easier to follow the latest updates. Links to RSS feeds for specific players are all located on this page. You can also find links to RSS feeds for various miscellaneous categories there. For instance, if you only want to receive one update every Sunday recapping the week’s notable headlines, you can subscribe to our Week in Review RSS feed, right here. The 49ers brought in tight end Chris Gragg for a workout, a source told Matt Maioccio of NBC Sports (Twitter link). An Arkansas product, Gragg was taken by the Bills in the seventh round of the 2013 draft. He spent the next four years in Buffalo, then was with the Jets during the 2017 offseason. Gragg has struggled with injuries, missing the entire 2016 and 2017 seasons while hurt. He spent all of last year out of the league, and this is the first we’ve heard of him in a while. Gragg had his most productive season in 2015, when he caught 12 passes for 150 yards. He’s unlikely to make much of an impact even if San Francisco does opt to sign him. The Buccaneers are making a historic move. Tampa Bay is hiring Maral Javadifar and Lori Locust as the first full-time female assistant coaches in franchise history, the team announced in a release. Locust will be an assistant defensive line coach, while Javadifar will be an assistant strength and conditioning coach. The Bucs are now the first team in NFL history to have two women as full-time coaches. New Bucs coach Bruce Arians has emphasized the need for greater diversity on NFL coaching staffs, and is now practicing what he preaches. Arians had said he would do something like this, so it isn’t surprising. Malik Jackson, DT (Eagles): Five years, $50MM, $17MM guaranteed. $9MM signing bonus, $1MM 2019 salary guaranteed. $7.6MM salary in 2020, $4.6MM of which is guaranteed. Base salaries of $9MM, $10MM, and $11MM in 2021-2023. Twitter link via Dan Graziano of ESPN.com. Jason Verrett, CB (49ers): One year, cap charge of $1.5MM. $1.1MM salary of which $600K is guaranteed, plus $400K signing bonus. Verrett “can earn up to $3 million for the season if he is active for all 16 games. It’s $31,250 per game on 53-man roster (up to $500k) and an additional Roster Bonus of $62,500 per game on 46-man game day roster (up to $1 million)”. Twitter links via Nick Wagoner of ESPN.com. Darryl Roberts, CB (Jets): Re-signed. Three years, $18MM max value, but essentially only a one year deal according to Darryl Slater of NJ.com. There’s $6MM in guaranteed money, with another $2MM of his 2020 salary guaranteed for injury only. $5MM salary in 2020, $6.5MM salary in 2021, and zero dead money in either year if they want to cut him. Tyrell Williams, WR (Raiders): Four years, $44MM. There was originally reported to be $22MM in guaranteed money, but that’s apparently not true. There’s only $10MM in guaranteed money in the contract, according to Vic Tafur of The Athletic (Twitter link). Logan Paulsen, TE (Falcons): Re-signed. Paulsen’s one year deal will have a base salary of $930K. Twitter link via Vaughn McClure of ESPN.com. Let’s take a look at the details of a few recently-signed contracts from around the NFL. Twitter links courtesy of Tom Pelissero of the NFL Network, unless otherwise noted. Lamarcus Joyner, S (Raiders): Four years, $42MM. $16.7MM in full guarantees — all due next week, per Mike Garafolo of NFL.com (on Twitter). Adam Humphries, WR (Titans): Four years, $36MM. 2019 salary of $12.5MM fully guaranteed. Beyond that, it’s a pay-as-you-go structure for Tennessee. Humphries is due base salaries of $7.5MM in 2020, $7.25MM in ’21 and $8.75MM in ’22, according to SI.com’s Albert Breer (on Twitter). Dante Fowler Jr., OLB (Rams): One year, $12MM fully guaranteed. Another $2MM is available through incentives (Twitter link). Bobby Hart, T (Bengals): Three years, $16.15MM. $7.4MM is coming Hart’s way in the first year of the deal. With incentives and escalators, the deal can reach a max value of $21.15MM (Twitter link). Shamar Stephen, DT (Vikings): Three years, $12.45MM. Stephen gets $5MM in the first year of the pact (Twitter link). The Antonio Brown saga rages on, as the Steelers continue to look for a trade partner for the All-Pro receiver. Brown made recent comments to ESPN that indicated he wouldn’t be accepting anything other than complete control over his situation, saying “I don’t even have to play football if I don’t want. I don’t even need the game, I don’t need to prove nothing to anyone. If they wanna play, they going to play by my rules. If not, I don’t need to play.” Brown’s threats to no longer play come on the heels of a report that quarterback play is a strong factor on where Brown wants to be dealt. Brown’s latest comments are a ploy to get the Steelers to release him, opines Charles Robinson of Yahoo Sports (Twitter link). Following up on additional speculation that the Steelers may be forced to just release Brown, Ed Bouchette of The Pittsburgh Post-Gazette tweeted that the Steelers “will never cut him,” and would rather trade him for a conditional seventh round pick than let Brown win. The latest report has the Eagles and Raiders as strong players in a potential Brown trade. The Broncos have been connected to Brown in the press, but the team isn’t interested in trading for him, according to Mike Klis of Denver 9 News (Twitter link). A source close to Denver GM John Elway gave Klis an “emphatic no” when he asked about the possibility of adding Brown. Klis writes that Browns is not “worth the price.” The Broncos recently announced Emmanuel Sanders would be back in 2019, and given that Sanders and Brown have feuded publicly in recent months, it makes sense why they wouldn’t be involved in Brown discussions. Add the Eagles to the list of teams that won’t be trading for Brown, according to Zach Berman of The Philadelphia Inquirer (Twitter link). A league source told Berman the Eagles “do not have interest.” The Eagles aren’t in the AFC and have shown a willingness to make bold, splashy moves so it seemed like a potential fit, but they apparently aren’t interested. Philly has also been linked to another soon-to-be former Steeler, Le’Veon Bell. There was a report yesterday from Mike Florio of ProFootballTalk.com that said the Steelers don’t have to pay Brown’s $2.5MM roster bonus until Week 1 of the regular season. Florio seemed to indicate that meant the Steelers aren’t in the rush to trade Brown by March 17th, when the roster bonus is earned, that many have assumed. But Jason Fitzgerald of Overthecap.com pushed back on that in a tweet, saying he’s “never heard of not having to account” for a roster bonus in a trade, even when the bonus isn’t due until later. Based on Fitzgerald’s reporting, it sounds like the Steelers will still be on the hook for the $2.5MM cap hit if he’s on the roster on March 17th, even if they don’t have to pay it until later. The NFL salary cap for 2019 has been officially set at $188.2MM, according to Ian Rapoport of NFL.com (on Twitter). That marks an increase of $11MM from last year’s figure of $177.2MM. This is the sixth consecutive year in which the cap has gone up at least $10MM per club. It’s a sign of continued success and increased revenue for the league, though the final mark is a bit shy of some projections. In December, the NFL told teams that the final cap would fall somewhere between $187-$191MM. The free spending of clubs has led some to speculate that the cap would fall no lower than $190MM, but ultimately, it doesn’t make a huge difference – revenue is up, the cap is up, and teams like the Colts and Jets have serious money to burn. Free agency begins on March 13, but a good chunk of the league’s cap space will be absorbed by extensions between now and then. Mark Walton‘s offseason has gotten off to a poor start. The Bengals running back was reportedly arrested in Miami last night (via Josh Alper of ProFootballTalk.com). It’s uncertain whether Walton was arrested on Friday night or early Saturday morning. Either way, the running back is reportedly facing a battery charge. David Ovalle of the The Miami Herald tweets that the Walton was taken into custody and has already posted bond. Following a standout career at Miami, the Bengals selected Walton in the fourth round of the 2018 draft. 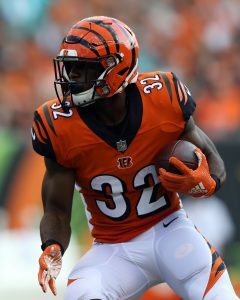 The 21-year-old was slotted behind Joe Mixon and Giovani Bernard during his rookie campaign, running for 34 yards on 14 carries in 14 games. He also added another five receptions for 41 yards, and he compiled five tackles on special teams. Walton could face punishment from the NFL, putting at least the start of his 2019 campaign in doubt. The Bengals have all of their 2018 running backs under contract for next season, including undrafted rookie Quinton Flowers.